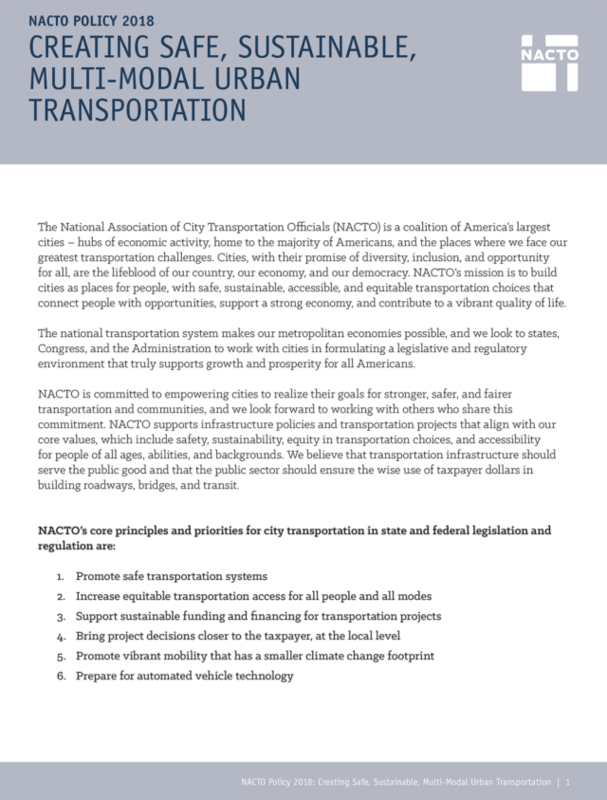 The National Association of City Transportation Officials (NACTO) is a coalition of America’s largest cities – hubs of economic activity, home to the majority of Americans, and the places where we face our greatest transportation challenges. Cities, with their promise of diversity, inclusion, and opportunity for all, are the lifeblood of our country, our economy, and our democracy. NACTO’s mission is to build cities as places for people, with safe, sustainable, accessible, and equitable transportation choices that connect people with opportunities, support a strong economy, and contribute to a vibrant quality of life. The national transportation system makes our metropolitan economies possible, and we look to states, Congress, and the Administration to work with cities in formulating a legislative and regulatory environment that truly supports growth and prosperity for all Americans. for people of all ages, abilities, and backgrounds. We believe that transportation infrastructure should serve the public good and that the public sector should ensure the wise use of taxpayer dollars in building roadways, bridges, and transit.